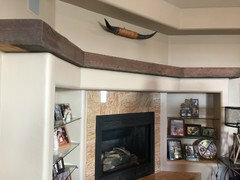 From a wreath made from palm fronds and jacaranda pods to one shaped like a thoroughbred racehorse, these entryway decorations show that Houzz readers know how to make an entrance. 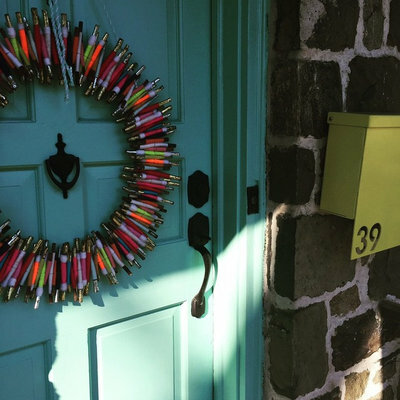 Some readers shared entryways that follow family traditions, while others reinvented their holiday decorating this year. Locally foraged materials enhanced many entry arrangements, but well-traveled antiques also graced front doors and porches. 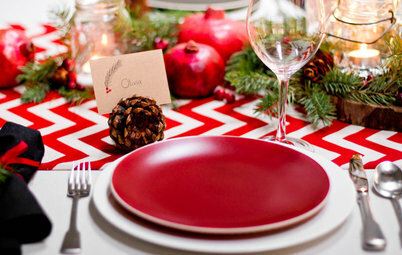 Here’s how 40 Houzzers are welcoming guests this winter. 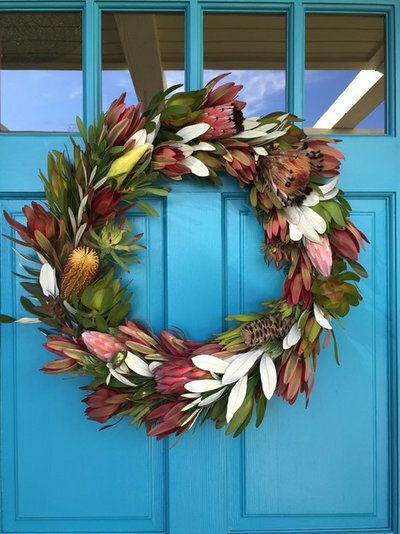 Judy Kennedy Elliott waits all year for her local farmers market to sell the protea wreath that decorates her Aptos, California, home every winter. “Ultimately, it dries and turns brown, but it is still beautiful, and I leave it up until I get the next one the following year,” she says. 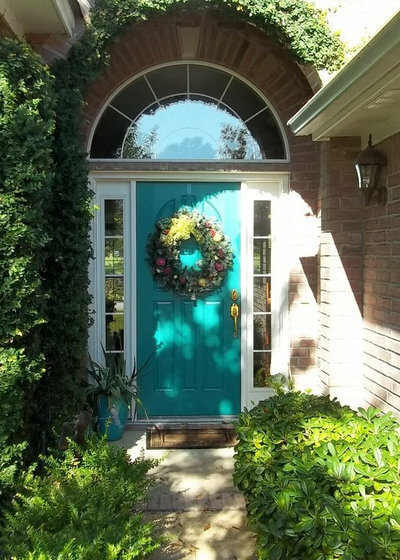 The dusty pinks, maroons and greens of this wreath pop against the custom-color turquoise front door, creating a contemporary and festive holiday entry. 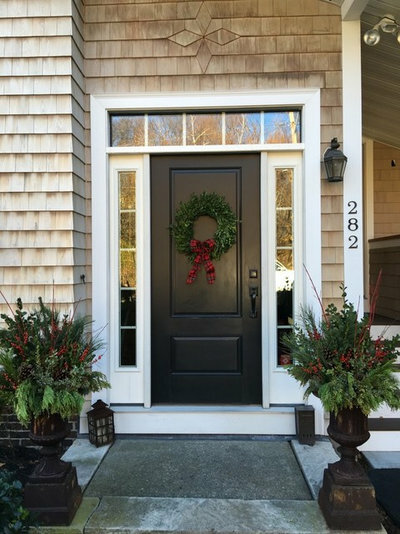 Houzzer gerernst’s ruby red door gets a holiday boost from an evergreen garland, a framed wreath and a Christmas tree sled. 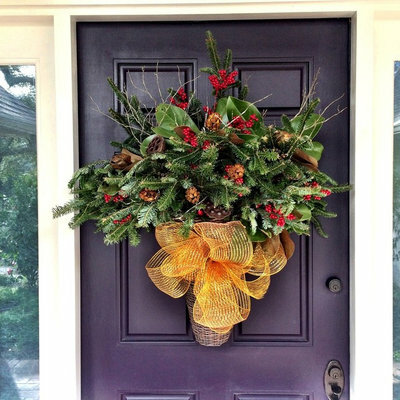 This evergreen arrangement on Mikie Folio’s front door in Florida features cuttings she collected from her family’s Christmas tree, magnolia leaves and sticks from her yard, dried pods from a floral bouquet and artificial red berries, all gathered in a French-style flower basket that hangs on the door knocker. “I have a natural yard that is a wonderful source for making arrangements,” she says. 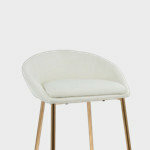 A wire gold bow finishes everything off. 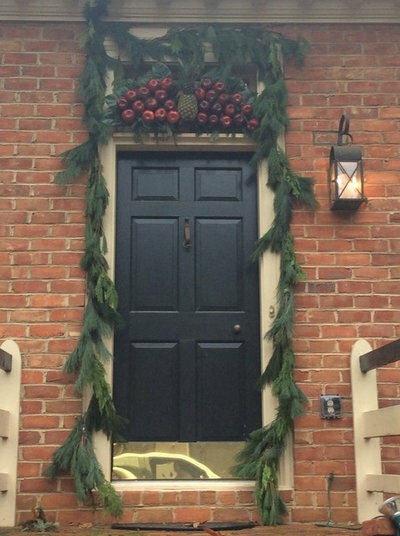 Laurie Ciulla Plasker and Noel Plasker’s front door features an Anthropologie wreath made with sticks wrapped in yarn. Fluorescent details, like the lime green mailbox and front door painted in Benjamin Moore’s Fun ’n Games contribute to the fresh and funky entry. 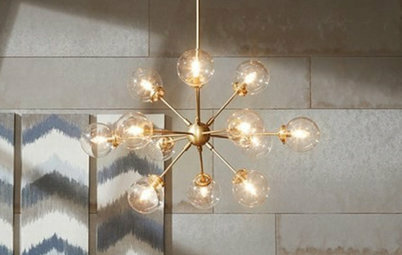 “I was raised celebrating Christmas, and my husband’s Jewish, so our holiday decor remains somewhat neutral, whimsical and minimal,” Laurie says. 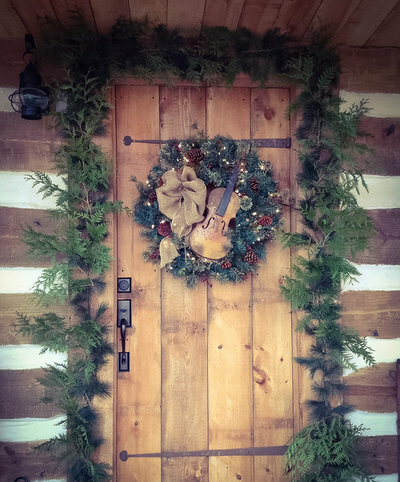 Alice Winkie brought a real touch of Kentucky culture to her front door wreaths, fashioning horse silhouettes out of white pine and fir cuttings. Winkie, who is a semiretired floral designer, attached the foliage to a hardware cloth form and then attached real horse bridles to the wreaths. “I always like to step outside of the box in designing,” she says — and her Louisville entry clearly shows it. This front door in Maui, Hawaii, is decorated with natural elements that Sandra Goldsby found around the island. Strips of palm leaves form the base, with jacaranda pods, pepper tree berries and autograph tree seedpods filling it out. “There is so much beautiful flora on the island, and being able to collect and use it makes it even more fun. I love the natural look and one that says Christmas in a Maui way,” she says. 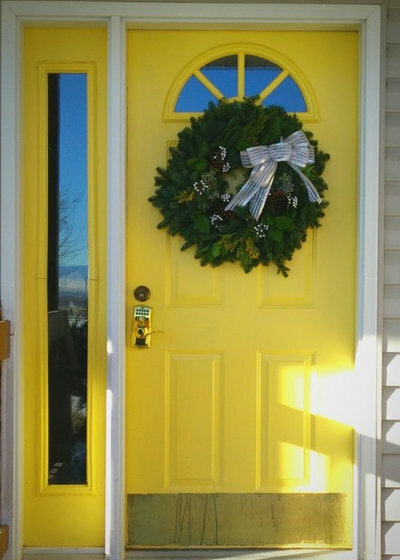 Susan Xanthopoulos received this wreath from a friend, and she is so happy with how it pops against the yellow front door. 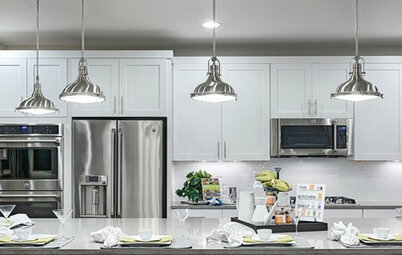 “I love how the yellow looks so unique and the light shining on it looks so festive and inviting,” she says. 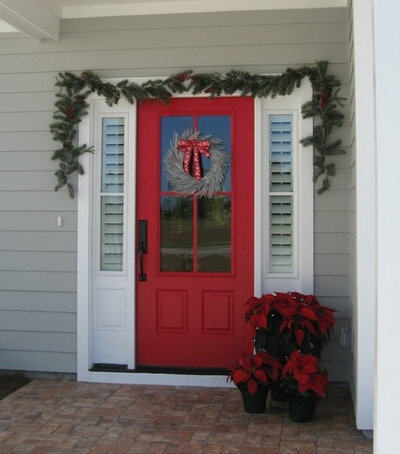 Patricia Diemand decorated the front door of her new house in South Carolina for the first time this year, since it’s her family’s first Christmas here. 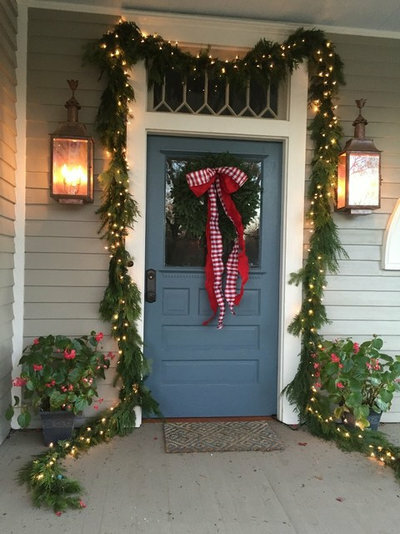 She hung a faux pine garland mixed with real pine cones and a twig wreath she painted silver, all complementing the very festive and cheery front door. 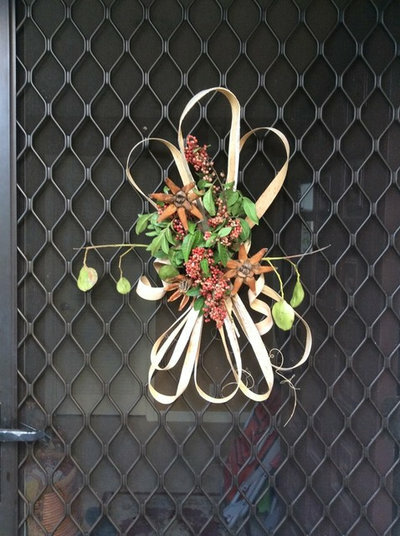 “I love the feel of 18th-century decorating, so my door reflects that,” says Alice Day, who decorated her front door with boxwood cuttings, magnolia leaves, real apples and a pineapple. A wood base with nails holds the apples in place, and the arrangement usually lasts for a couple weeks before local wildlife eats it. 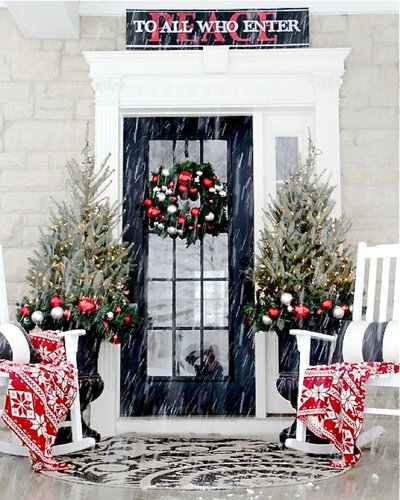 Winter weather came early in the Midwest this year, but that didn’t stop Sarah Mackhlem from decorating her front entry. 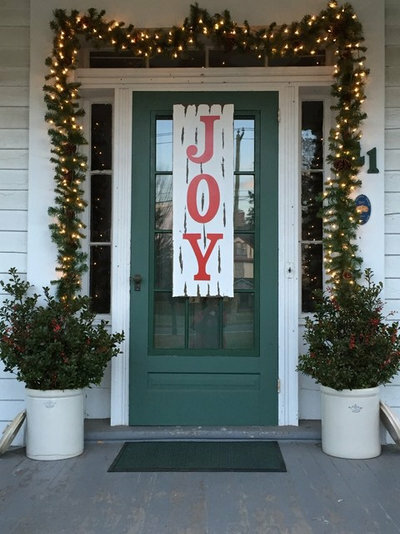 She made the “Peace to All Who Enter” sign using scrap wood and paint markers, planted real trees in the flanking urns and brought out some indoor-outdoor textiles to welcome guests inside. 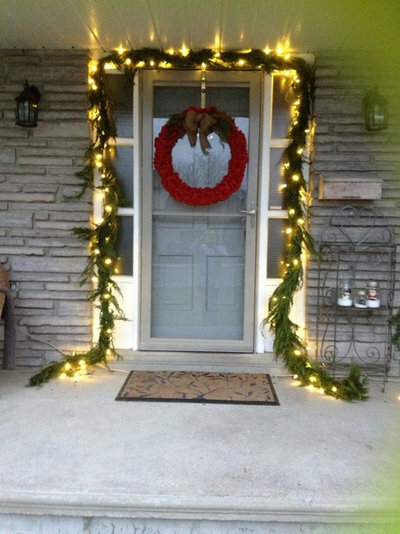 Elizabeth Bear and her husband kept their front door simple, framing it with an evergreen garland wrapped with string lights and hanging an oversized green wreath in the center. 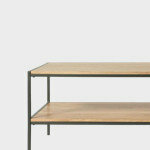 “We like things that are simple but whimsical and that have an impact,” she says. The contemporary house numbers, front door monogram and neutral colors contribute to an entry that feels current but recalls tradition. What’s old is new again, as seen in the photo of this contemporary turquoise entry uploaded by Val Bratcher Custom Homes. A vintage-style plastic Santa Claus welcomes visitors and opens up a window to the past. 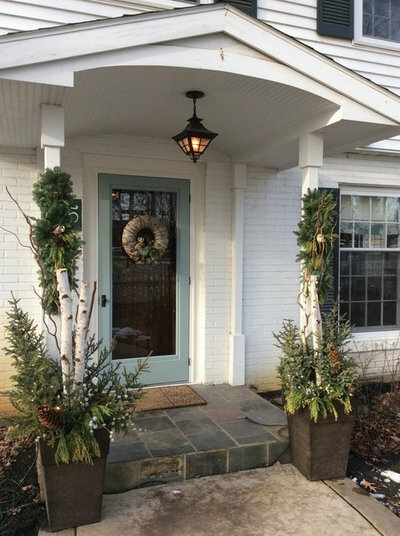 Birch branches, evergreen foliage and pine cones make up the natural and elegant container arrangements that flank Anniebird’s front porch. 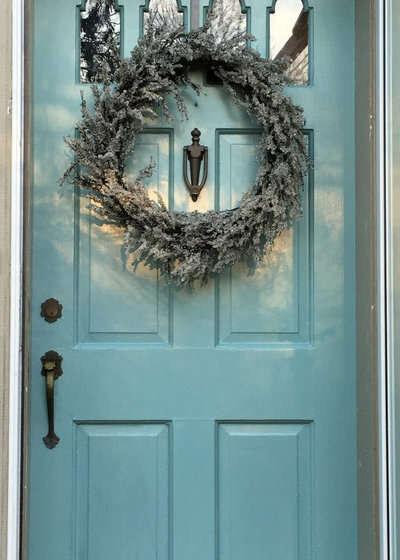 A wrapped wreath and powder blue front door round out this cool winter collection. 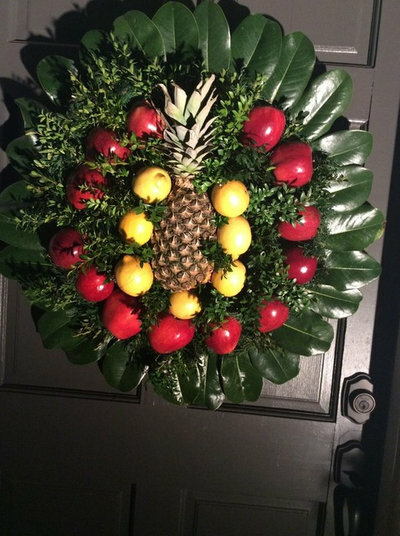 For this edible wreath, Sherry Murphy attached a pineapple and apples to a wooden form with nuts and bolts. She attached the lemons to the pineapple with wood skewers and filled in the wreath with boxwood and magnolia leaves. 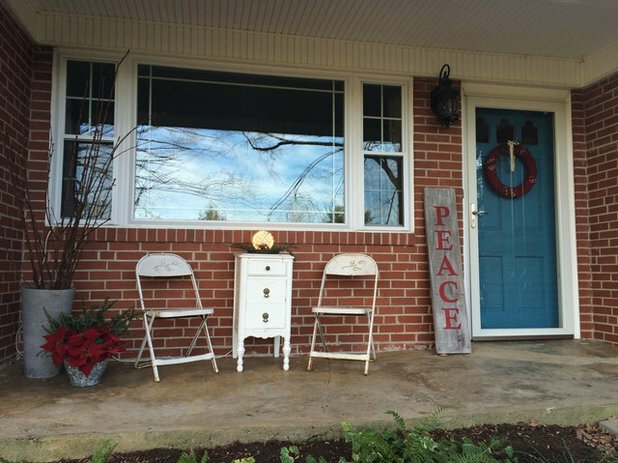 Dramaqueenmother’s country-style holiday porch attracted the attention of at least one furry friend. 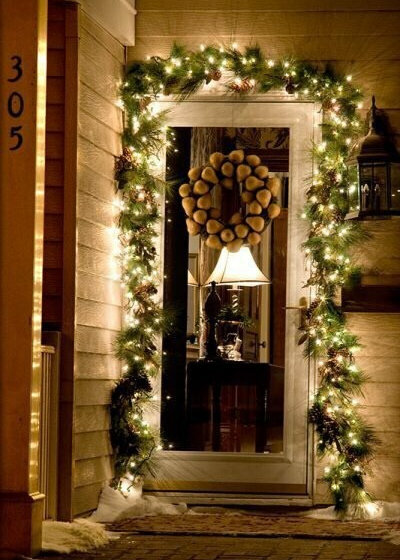 “My front door decoration is based on my need to simplify the holiday season. 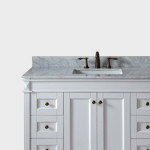 I love rustic decor and well-used antiques,” Leslie Leedy says. 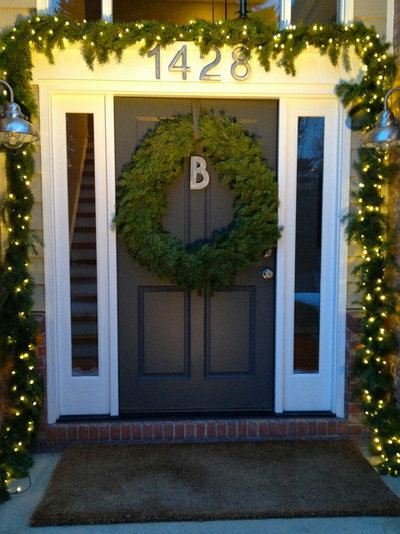 She made her wreath with fresh greens and berries, which she also added to the house number “flag” her husband made from wood pallets. A sled from her father’s childhood leans next to the door. 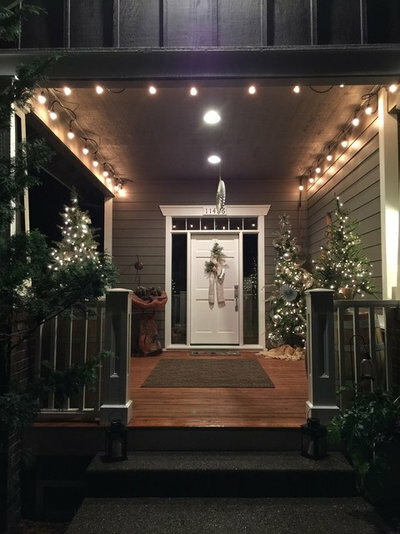 An oversized porch provided Houzzer marcher428 in Portland, Oregon, with the perfect spot to add three Christmas trees, all decorated in cooling whites, silvers and natural burlap. 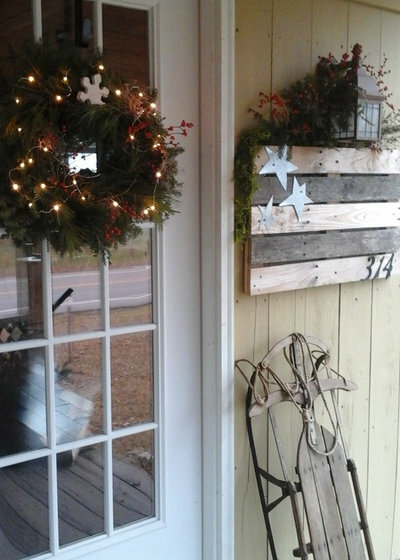 Captured_by_love shared an entry that emphasizes casual, rustic comfort, with a reclaimed-wood plank and woven wreath. 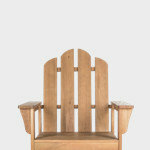 Folding chairs and a nightstand on the front porch create a spot to sit and enjoy the outdoors. 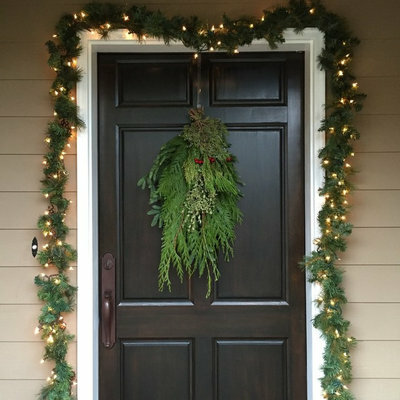 A cedar garland and homemade burlap wreath accent Brenda Gluska’s front door. The burlap wreath was a first for Gluska, who usually makes a fresh evergreen wreath for the holidays. This is her family’s first holiday season in this house, and their new yard didn’t provide the foliage she needed, but she was excited to try something new. 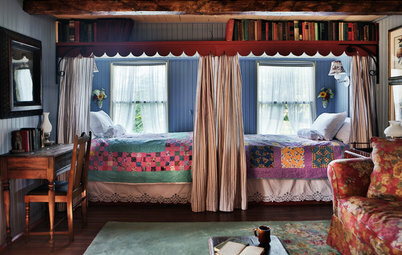 “It’s not perfect, but hey, it’s homemade and homey and (I hope) fun, warm and welcoming, and signals that the people inside are too. I love seeing the lights and decoration every time I come up the driveway,” she says. 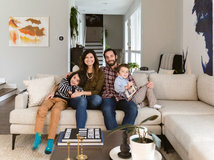 Sara Houser matches her holiday decorating style to her preference for transitional design, but she also makes sure to keep things fun for her two young sons. 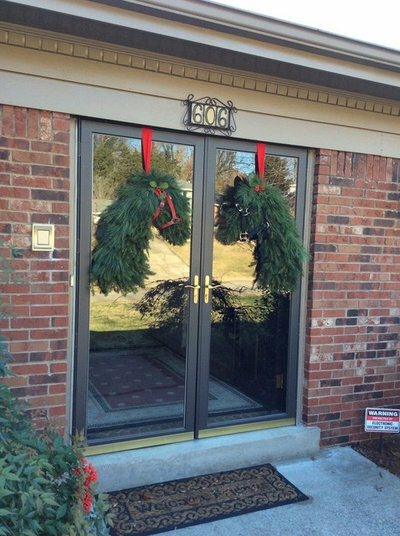 The ribbon wreath and evergreen containers for her holiday front door keep with the transitional style. “it wasn’t until I came across the elf feet at Pier 1 that I knew I found the missing element — whimsy. The feet make me smile and giggle, reminding me of the joy and wonder the season brings,” she says. Molly the dog looks on. 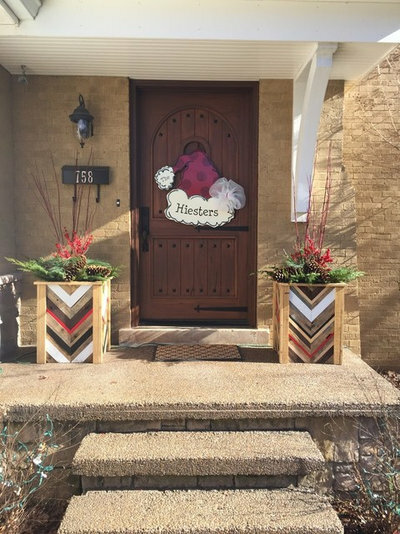 Bright, modern wood planters made by Emily Hiester’s husband from reclaimed barn wood flank the couple’s front door. A mixture of pine cones, cedar, juniper, fir and redtwig dogwood fill the planters. 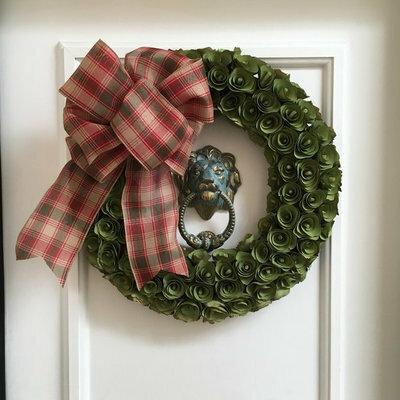 Winter decor usually features evergreens and branches, but Stephane Parkes shared a wreath made from artificial flowers that decorates her Old Town Alexandria, Virginia, home. 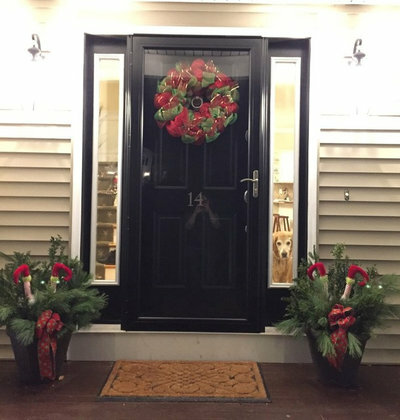 Kris Ikkela used a mixture of greenery she cut from her yard and bought at a farm stand to create these ornamental urns and front door wreath. “I like to display the natural beauty of the season in a classic, informal manner,” she says — and her Boston entry shows it. 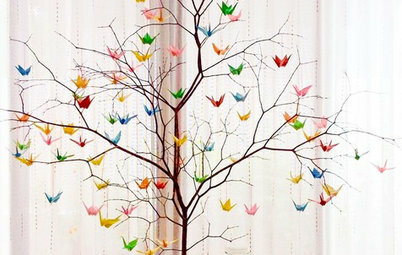 Extra-long trailing garland and ribbon tails dress up this entry uploaded by Houzzer aacm. 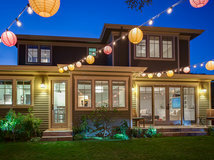 The red begonias and buffalo plaid ribbon add color interest on this otherwise foliage-filled entry, and the oversized copper lanterns beckon guests in for the evening. Lanterns, rustic stars and a vintage sled and ice skates create a playful, eclectic entry for this Colonial Revival-style home in Nebraska. 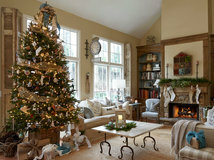 “I just put things together and stop when I love the feel and welcome look of holiday season decor,” homeowner Cindy Hutchinson says. 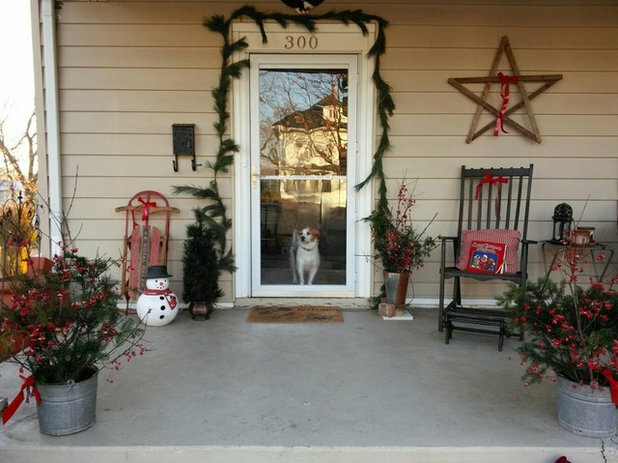 Two wreaths decorate this front entry, and Paige Ward creatively hung them from her porch instead of on her bright pink front doors. The Palm Beach-inspired entryway started with an Audubon flamingo print hanging in the entry, and the front door color, Benjamin Moore’s Bird of Paradise, was pulled from that. 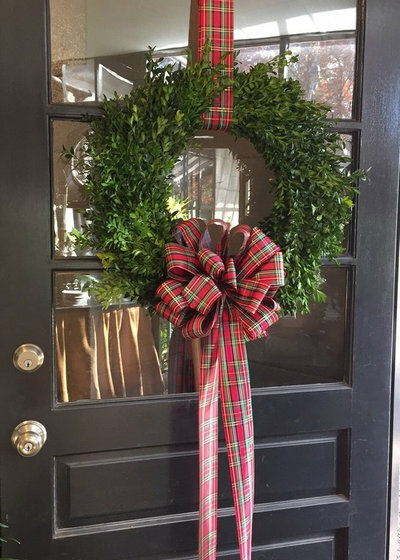 Joanne Peterson channeled this year’s plaid trend by tying an oversized plaid ribbon bow to a simple boxwood wreath. 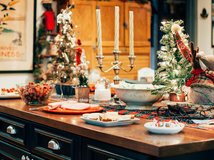 “This timeless combination takes me back in time to memories of Christmas decorating with my grandmother, as she taught me all of her tricks and talents of classic Southern decorating,” she says. 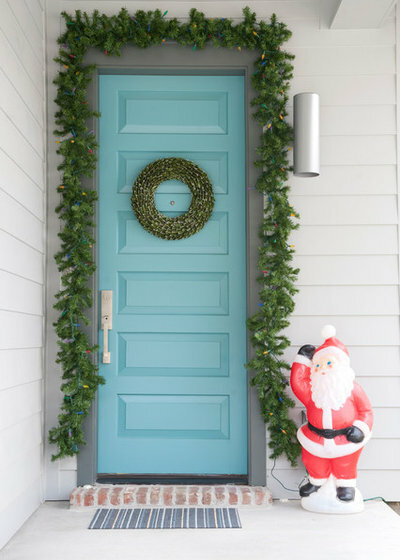 A lime green ribbon tied around a traditional Christmas wreath, along with a turquoise front door, brings bright color to Gloria Ogden’s southeast Texas home. “The door just makes me smile every time I look at it,” she says. Robert Berg’s house in Palm Springs, California, may not look wintry, but it sure is in the holiday spirit. The nutcracker guarding the entry is part of a larger collection of nutcracker statues that decorate the house. 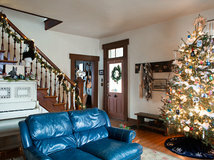 The wreath with red ornaments was selected as a complement to the nutcracker. 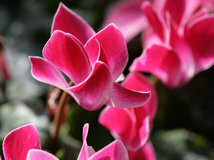 Potted plants, including some poinsettias Berg said were added to the nutcracker base after the photo was taken, can survive outside all winter long due to the warm weather. 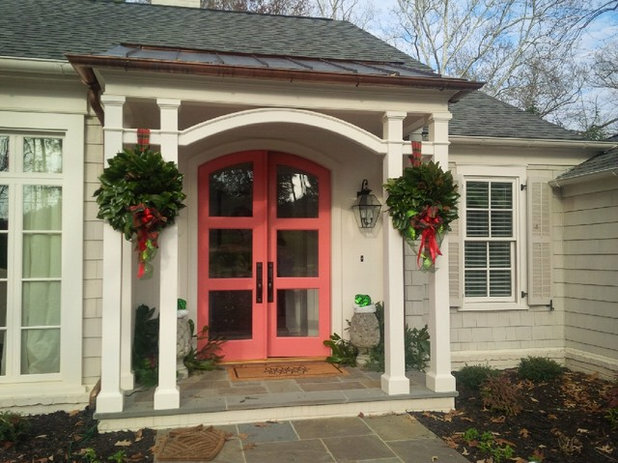 Nourishandnestle’s pink and white front door is a departure from her favorite red and green combination, but a flowering camellia bush next to the front door inspired a different color palette this year. 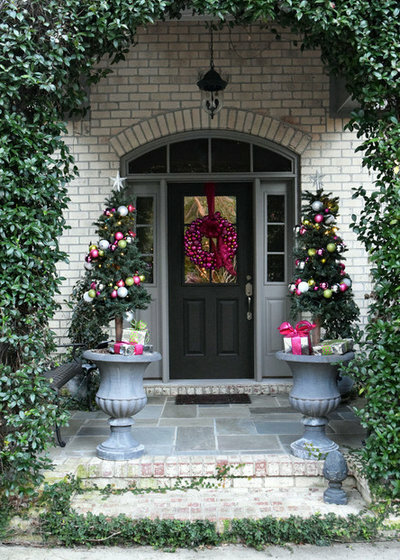 Christmas ornaments in varying shades of pink are glued to a foam wreath, and ornament garlands wrap around two potted topiaries in front of the Wilmington, North Carolina, home. 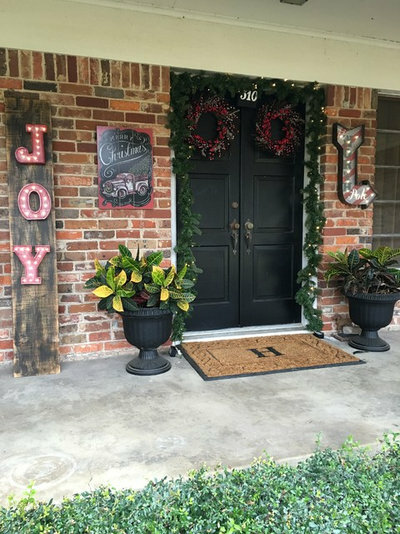 Every Christmas is an opportunity for Heather Frasier to decorate her front entry in a new theme, and this year she took a rustic approach for her home in the historic district of Rockwall, Texas. 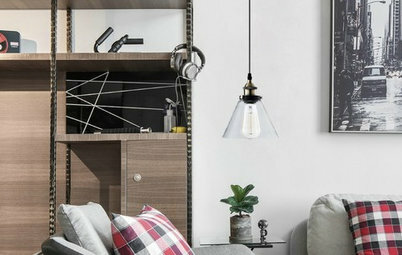 “The rustic take this year was inspired by all of the plaid this season. It took me back to going to a Christmas tree farm when I was little and picking out our family Christmas tree,” she says. A pear wreath and an illuminated garland invite guests in for a warming respite from the night in Houzzer njjonesstore’s Richmond, Missouri, home. 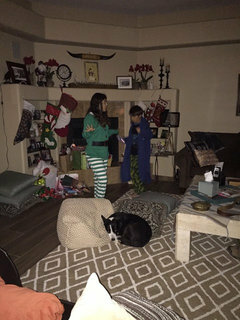 Julia and Gary Blumstein kept their holiday front door rustic and natural, like the rest of their house, using fresh greens they collected from their property. A child-size violin on the wreath speaks to Julia’s musical background. “Just a simple rustic welcome for the holiday season,” she says. 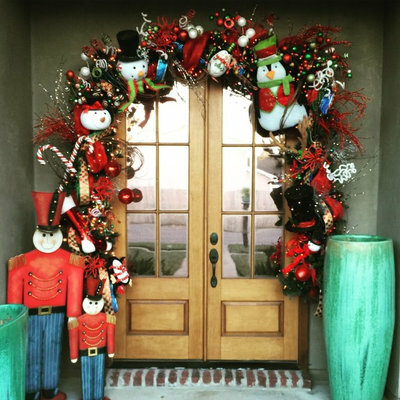 Mia Robinson prefers the more-is-more approach when it comes to holiday decorating, and her Christmas front door in Louisiana is a shining example. “We may not drop below freezing very often in south Louisiana, but our snowmen and penguins don’t seem to mind,” she says. 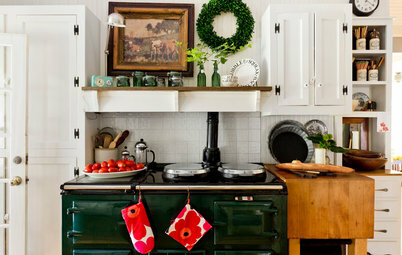 Cindy Shultz shows off her playful decorating style in a mostly traditional neighborhood. 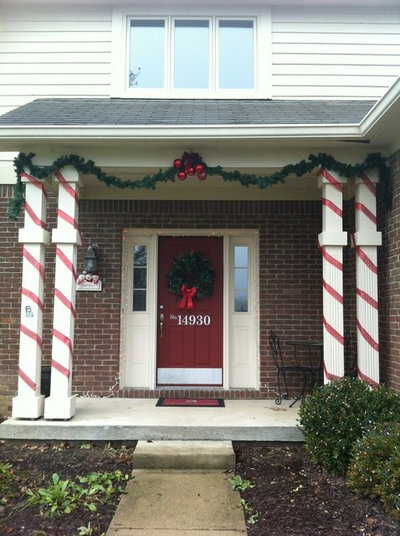 “I wanted to play off our red door and doormat, and thought the columns would look great as candy canes,” she says. 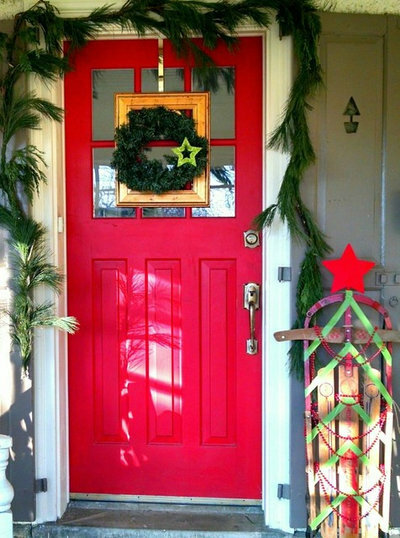 Bright red ornaments and colorful lights add to the festive front door. 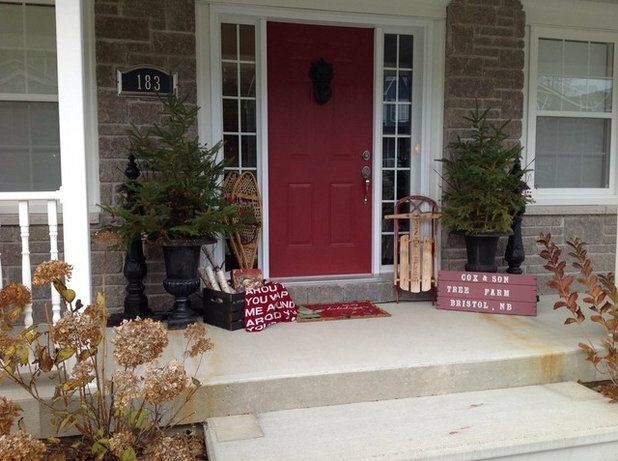 This year Carmen Murphy-Cicin decorated her front entry in Fredericton, New Brunswick, Canada, with rustic, collected elements that also serve as reminders of her past. 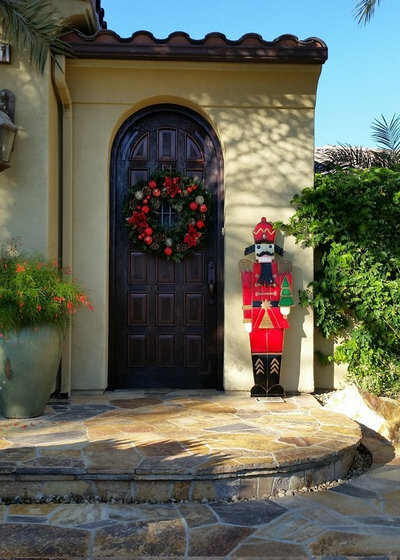 “Every year I like to change my main entry display, and I generally have one that stays out through March, deleting the Christmas-specific elements, while enjoying the rest throughout the winter season,” she says. 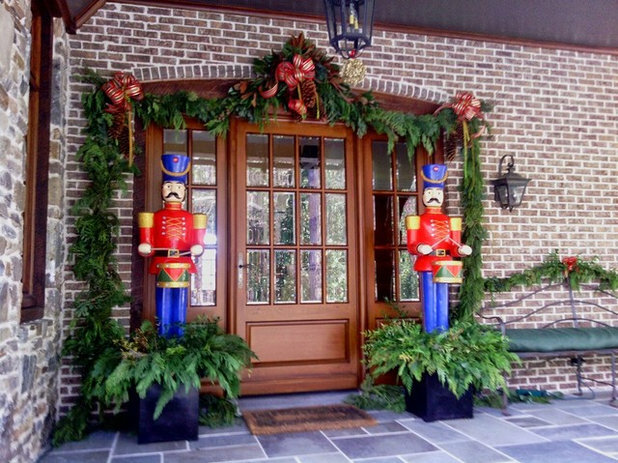 Jbcdecor’s front entry features an evergreen garland and containers similar to others seen above, but two life-size toy soldiers bring the playful holiday theme to life. 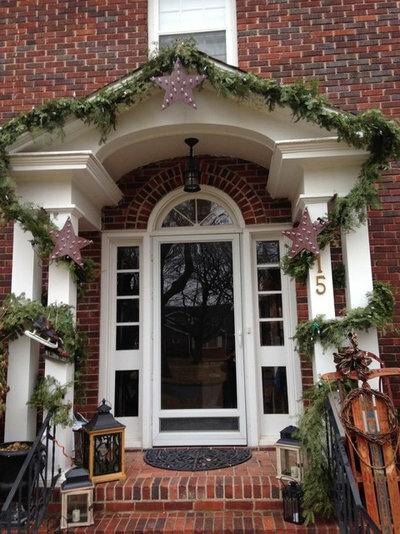 In Roanoke, Virginia, Ashleigh Blankenship keeps things cool and wintry with an icy-looking wreath and a snowflake hanger. My comment here is that some of the decorations are dark green on dark backgrounds and hardly visible. 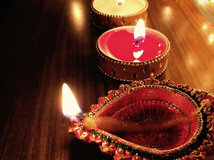 Thought should be given to contrast, especially when decorations need to be visible from a distance. One can overdo contrast also, but your decorations need to be seen to be appreciated. I'm going to be so sad to take mine down in the next week or two.